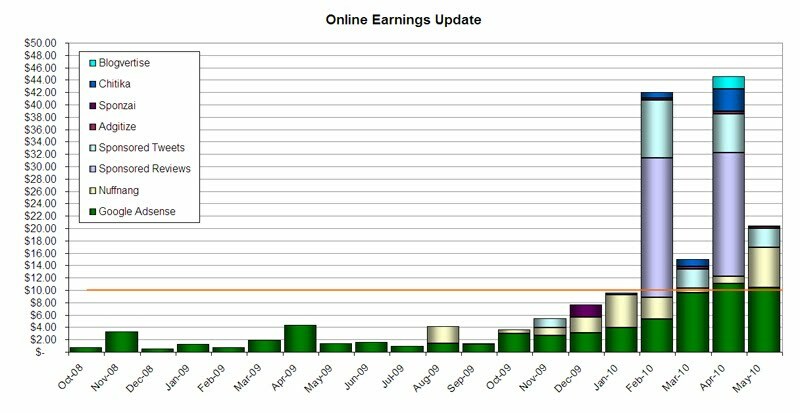 "Earning 10 in 2010" - May Online Earnings Update! As a disclaimer, I will say this series is meant to share my experiences in this venture - but mine is a personal blog that does not receive a whole lot of traffic, I do not have a lot of time to blog, but do want to earn a little bit from it. If you are in the same situation, I invite you to share what you know and how your efforts have been fruitful. If you are a newbie like me, then read on and join me on this journey! It has become apparent that I will probably be earning more than my target $10 per month every month until the end of the year. My Adsense earnings have been growing (albeit slowly) in the past 5 months or so - and this month, for the second month in a row, it actually earned enough to cover my target $10. 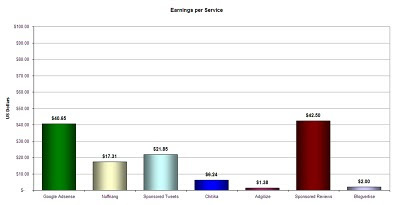 That means all other services are revenue. :p Awesome! Google Adsense - $10.41 - The Philippine Elections and Jejemons helped to increase my blog traffic and earnings on Adsense this month. I had a difficult time accessing PPCRV and the Comelec website during the elections and so I contented myself with looking at PPCRV Twitter updates. I found it was a bit difficult to read from Twitter and so I transferred them to a blogpost. Turns out a lot of people were interested in that. I find it ironic that my "Learn How to Jejemon write" post is one of the Top Search Engine results for this keyword. I mean I am hardly a Jejemon and would even readily join the Jejebusters army. Hehehe. :p But I guess Google doesn't discriminate. Go ahead and search for "Learn Jejemon" on Google. Sponsored Tweets - $3.13 - This was quite an exciting month for Sponsored Tweets, obviously not because I earned a tremendous amount of moolah (heh), but because they launched a new service for CPC tweets! Read more about CPC Sponsored Tweets here: "SponsoredTweets CPC". Chitika - $0.05 - Five cents?!?! Lol. But no worries, Chitika is upgrading their configuration and their ads. Reyjr.com was "Pending review" for most of May, but was finally (finally!) approved in the last week or so. 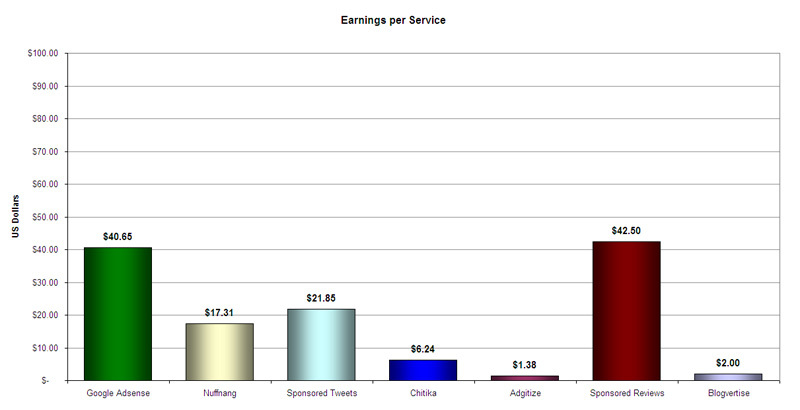 With these changes I am hoping to get more revenue from Chitika in the months to come! Fingers crossed! I have now earned a total of $131.59 (roughly Php6,300.00) in the first 5 months of 2010... and still waiting for the day when I get to receive a check from Google every month. (still waiting...LOL!) 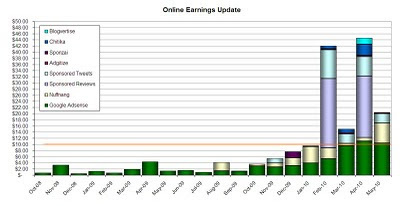 Below is the breakdown per site/service of my January to May 2010 online earnings (only). 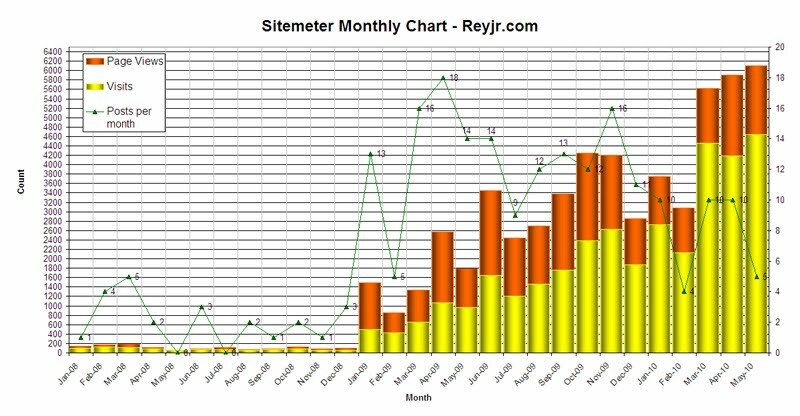 One final chart I wanted to share with you all for this month is my Sitemeter tracking for my blog traffic. 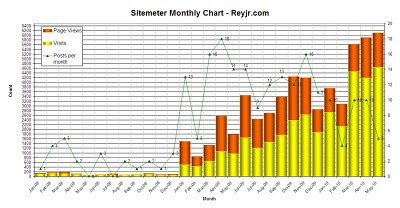 In May 2010 alone, Reyjr.com received around 4600 hits. That would be more than 4 times the hits it received in May 2009. And more than 90 times the traffic it received in May 2008 (when my blog received a whopping 50 hits :p). What I think is more interesting though is - do you see those tiny columns on the left side of the chart? Those are 2008 monthly hits. Between 2008 and 2009, my blog hits increased by 1,658% - I of course attributed it to more posts - from 2 posts per month in 2008, I averaged almost 13 posts per month in 2009. This year though, in the first 5 months of 2010, my average monthly blog traffic increased by 136% compared to 2009 - BUT my posting frequency decreased by almost 40%! I do hope my blog continues to grow as I have bigger dreams for it. Hopefully when the income from blogging becomes stable, I can set up a one-time Scholarship grant, or help sponsor a Choral festival. That would be tremendous. :) For now though, I'll keep on trying my best. How about you? What are your dreams for your blog? Sabagay, it's fun reviewing different stuff. I think we have to review more of the non-food things. Baka tumaba kami ng over! haha :) Joint review nga tayo minsan! Hey, glad you liked the post on Emir. We're going to watch it. Looks interesting! oh I definitely do NOT want to stick to the status quo :P i just don't see my site becoming a mega blog. *shrug* maybe eventually? i need an idea..